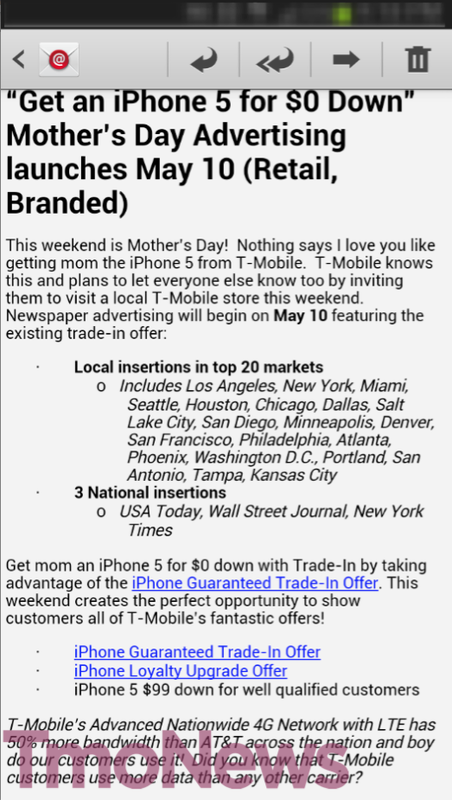 T-Mobile’s advertising for Mother’s Day weekend will focus heavily on the iPhone 5 and the trade-in promotion that has been ongoing since April 12th. That advertising itself will see three national newspaper insertions as well as papers in the top 20 markets. The offer allows both new and existing qualified customers to trade-in an iPhone 4 or 4S and receive a trade-in amount that helps wipe out the down payment on the iPhone 5. The result being a “$0 down” net payment for customers and a decreased monthly payment of $15, down from $20 saving the customer $5 per month. The offer is good for both GSM and CDMA iPhone 4 and 4S models and is good at any T-Mobile company-owned store this weekend and until June 16th. Does nothing say “I love you mom” like an iPhone 5? Flowers work too…hint hint, wink wink. You can read our original post which includes the Loyalty Upgrade offer here. what a rip! you can sell your 4s for $300 on cl. True for the 4S, but this deal is worth $219. Not bad for an iPhone 4.
yes i agree, the 4 is worth it. you can also get robbed and shot from a cl meet too. I buy phones on craigslist all the time and I rarely have any problems. I bring a handgun for protection, just in case. There’s usually no trouble at the meet ups. Interesting thing though, most people just give me their phones for free and leave quickly. Craigslisters just don’t have time to waste. A couple times, the other guys became aggressive but fortunately I had my gun so they calmed down and gave me their phones for free after I fired a few warning shots. Just remember to be careful and you can get great deals off craigslist. If you’re that paranoid about selling on Craigslist meet in a public place. Better yet when you sell something on Craigslist have them meet you in front of your local police station. I’ve sold many things on Craigslist and have never had that problem. It’s good for an iPhone 4. Particularly the CDMA (Sprint/Verizon) version. Those are near worthless anywhere else. Yep. Just bought my mom’s iPhone earlier this week. Darn. I have a 4 that gets 0 use these days. you have 14 days to return it. just talk to mgr he/she should be able to honor the deal for you. I would love to trade in my HTC HD7 WP for a i5 but that won’t happen ,lol. what do they do with all the old iphone4s? are they being sold to an electronics salavage company? They sell them to one of those large companies that buys used smartphones and resells them via eBay. They probably do the same thing Asurion or Gazelle do – recycle them for parts/refurbs. I’m just poking at everyone. Surprisingly, my mom chose an Android over the iPhone. But why stop at only iPhones? truth! My wife’s side of the family – all aunts, uncles, mom/dad-in laws ALL have iPhones and iPads. Funny thing is, they don’t even use all the features of the phone, half don’t even know how to use iTunes to manage their 1 gb of music. It’s a status symbol thing, I suppose. Incidentally, they also dont’ care which version they’re using. A few still use hand-me-down iphone3 from their kids, most have iPhone4. Ha ha ha, that sounds familiar. the ones that use the iPads only use it to surf the internet at home via wifi or torture me with their family photos. Most are too frugal to buy e-books or premium apps, etc. They balk at the fact fruit ninja costs money, and end up playing Angry Birds. And they all have $700+ desktop PCs too. smh. what a waste of money. Look at all the silly people buying pants with four pockets. Most only use one, maybe two. Think of all the stuff they can carry but they’re not using their pockets to the full potential! You don’t have to use all the features of a phone or tablet to make it useful. If surfing the web or watching movies is enough to justify a phone or tablet purchase that’s their choice. we all derive different values on the products we buy, agreed. Any trade-in offers for the iPhone3? okay, I’ll show myself the door…..
Is it the iPhone 3G you have? They’re still going for around $100 on craigslist where I live. Which is crazy when you think about how long ago it came out! How can they put both 4 and 4S in the same category …. lets say if I trade in iphone 4 32gb will I get an iphone 5 32gb or 16gb? you don’t understand the concept of this “trade” do you? It’s not a phone for phone trade. You turn in your phone, they give you cash value for it towards the purchase of an iPhone 5 that can be applied towards the down payment. You’ll also need to check to see if the T-Mobile stores are carrying the 32GB yet. Last I knew, you could only get those online or through Apple directly. This makes it sound like an account credit. Could I trade in a Sprint iPhone 4s for an account credit and get an Android phone. I really need Wifi Calling. This actually is a pretty good deal with the monthly discount tacked on. Before the promo the phone would have cost a user $579 over a two year period, however with this promotion the iPhone 5 becomes only $360. From what i understand, this reduced monthly is only if you trade in the 4s right? Is this promotion any better than the trade-in offer for the last month? I went into a corporate store near Chicago today and they only offered $124 for an unlocked AT&T iPhone 4 16GB. They didn’t know anything about a $5 monthly payment discount either. Edit: Never mind. This article’s statement “The result being a “$0 down” net payment for customers and a decreased monthly payment of $15, down from $20 saving the customer $5 per month.” applies only to the iPhone 4S based on the $219.99 trade in price. The 2nd and 3rd of the 3 slides above shows this pricing a little more clearly.